That a film with the pitch 'an autonomous police robot equipped with an experimental learning AI is stolen by South African 'zef' rap band Die Antwoord who raise it to be their gangsta robo-son' was put into production, made and has been given a wide release proves that we truly are in the best of all possible worlds. In typically bold Blomkamp style, Chappie plunges us into sci-fi as political allegory, the film a prism through which various theories of class, culture and philosophies are refracted in deeply entertaining ways. We open in near future Johannesburg. Faced with a violent crime epidemic, robotics company Tetravaal have invented and implemented a mechanised robot police force. Working in tandem with human officers, these Judge Dredd-like automatons are programmed to violently resist any criminals with a variety of high ordinance. Under the cosh of these bulletproof overlords, crime falls. This is a problem for criminals across the city, but especially for eccentric performance art gangstas Ninja and Yo-Landi. With a rival boss after their blood for a botched drug deal, they realise they have to pull off a major heist to pacify him. Knowing they don't stand a chance against Tetravaal's robots they hatch a plan to kidnap their designer Deon (Dev Patel) and get him to reveal how to switch them off. What they inadvertently end up with is Chappie (mocapped by Sharlto Copley), a damaged, child-like police robot with a quick-learning AI brain. Under Ninja and Yo-Landi's tutelage (and to Deon's dismay), Chappie becomes a foul-mouthed, strutting, dayglo gangsta robot - perfect for a crime spree. Watching angrily from the wings is rival robot designed Vincent (Hugh Jackman), whose huge Metal-Gear-a-like VR piloted 'MOOSE' is roundly mocked as overkill. The seeds of confrontation are thus set, society rapidly devolving into anarchy while Ninja, Yo-Landi and Chappie struggle to survive assaults from rival gangsters, cops and Vincent's MOOSE. 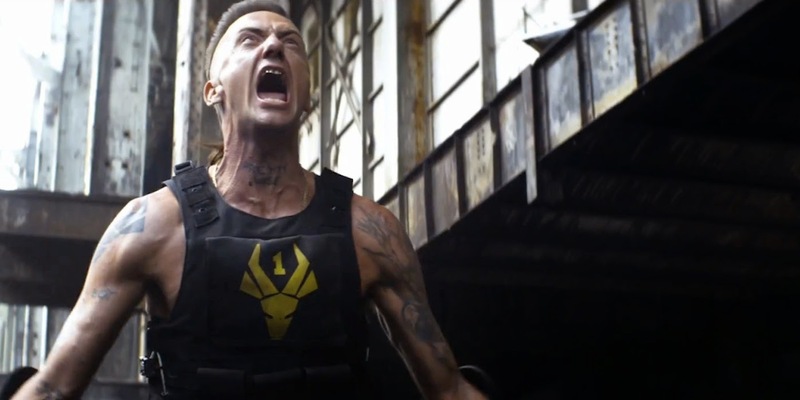 First things first; enjoyment of Chappie is largely predicated on your tolerance for Die Antwoord. For those not in the know they're a rap duo as performance art project, the two members devoted to living zef. In practice this means ridiculously vulgar materialism, a commitment to being as obnoxious as possible at all times, a childish dayglo aesthetic and religious devotion to the 'gangsta' ideal (all of which are summarised in one of their excellent videos). Needless to say I think they're dead cool. In Chappie they play lightly fictionalised versions of themselves, wear their own merchandise and spraypaint the eponymous robot with their logos. Thus, the film stands as an extension of their zef evangelism. At it's core Chappie is a paean to punk - demonstrating the joys of removing yourself from bougie society by donning a liberated art gangsta persona that's ready to gob a big ball of sticky phlegm in the eye of anyone that'd dare to disrespect you. Sounds fun right? Well in both Chappie and reality, this translates to Ninja and Yo-Landi being irredeemably scummy arseholes (especially Ninja). They're such an affront to polite, middle class sensibilities that when Deon disgustedly refers to Ninja as a stupid, vicious moron it's difficult not to agree. It's similarly really easy to sympathise with his horror as he sees the child-like, naive Chappie becoming morally corrupted by his zef education. But peer a little closer and Chappie's 'corruption' reveals itself to be personal liberation, a perfect example of Ninja's philosophy: "People are unconscious and you have to use your art as a shock machine to wake them up." A repeated motif in Chappie is the notion of fully identifying with the 'black sheep' - permanently aligning yourself with hated, deviant outsiders in order to realise your maximum potential for social change. This means that Chappie eventually evolves from mindless cog in the system towards agent of revolutionary change, the zef 'black sheep' perspective allowing him to see new solutions; the creation not only surpassing, saving and educating his creator, but eventually seizing the means of robotic production and acting as midwife to a 'new society'. Chappie fits neatly alongside Blomkamp's excellent District 9 and the flawed but ideologically sound Elysium in outlining the potential transformative power of the downtrodden, spat-upon and discriminated against. These politics, combined with Die Antwoord's obnoxious aesthetic and performance art sensibilities combines to create a science fiction treat that's as smart as it is cool. There's also giant robot fights, brill comedy sequences, beautiful special effects and Hugh Jackman in some very tight shorts. Chappie is bold, brave, brilliant cinema, and miles from your usual multiplex fare. Go and see it already!